I became close friends with Fotis Oikonomou during my last several days in Greece. He chants at St. Irene's, and I have seen him over the past couple of weeks, but had not gotten to know him until last Saturday. 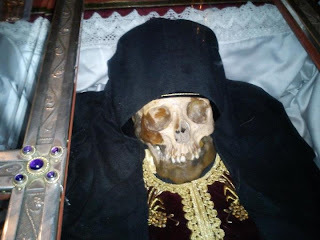 After vespers, I went to the Metropolis to venerate the relics of Sts. Philothei and Hieromartyr Gregory. 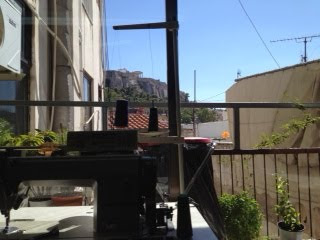 Fotis had the same idea, and we spent some time talking on the steps of the metropolis. This Saturday, 30 June, Adrian and I again met Fotis after vespers. We walked went for some coffee near Monastiraki. A beautiful icon adorned the wall of the cafe. A gypsy rode a motorcycle down the street with a sound system blaring. With cappucinos in hand, we walked past the ancient Agora to Thisseo, an ancient sacrificial site. We sat in a park, under tall pine trees. Fotis played "The Scientist" by Coldplay as he told us about his life. His father and grandfather were killed by a drunk driver four years ago. This and other sufferings has produced an incredibly strong and vibrant faith. "My father is close to me. Sometimes my [baptismal] cross is heavy and pulls from my neck. Sometimes I feel my father pat my knee." After changing the music to "Hurt" by Johnny Cash, Fotis showed us a photo on his phone. He has a huge smile and is flashing "thumbs up" next to the skull of St. Ephraim of Nea Makri. "We're homeboys...both from Trikala." We proposed going to Nea Makri the following day, as Adrian had not visited the Saint. Fotis was excited to visit the saint again. He is a graduate student of informational technology. He is finishing his masters and hopes to earn his doctorate in England. He has asked God for three things: to study chant with Angelopoulos, earn his degree, and find a strong Christian wife. God has granted him two of these: he asks us to pray for him to find his wife. As dusk was descending, Adrian and I wanted to grab a bite to eat. We parted ways as Fotis headed towards the metro at Syntagma. On Sunday morning, 1 July, Adrian and I stood with the choir one last time. They were quite impressed with his deep voice and low ison (drone). 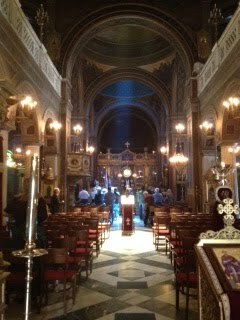 After the liturgy was a memorial for all Greek Orthodox killed by the Turks. The bus finally arrived. We rode it for an hour to Nea Makri. In the square, we got souvlaki before we began the 4 km uphill hike to the monastery. Along the way, Fotis retold the story of St. Ephraim: in the mid 15th century, the Turks invaded central Greece and forced Christian boys into military service against their own people. St. Ephraim's mother sent him to Attika (not yet overrun by the Turks) to escape. He became a monk and excelled in asceticism. He became a hermit up in the mountains and came to the monastery once a month for communion. One Sunday, he returned to the monastery to find all of the brothers slaughtered by the Turks. He gave them a proper burial and lived in the monastery. The Turks returned. When he would not convert to Islam, they nailed him upside down to a berry tree and tortured him every day for 9 months. On 5 May 1426, the Turks took a burning log and pushed it through his stomach. He was fogotten for 500 years. In 1950, a nun took up residence in the ruins of the monastery. Following an inner voice, she found the buried relics of the saint, cleaned them, and placed them in the church. Because he suffered greatly, he works countless and great miracles. 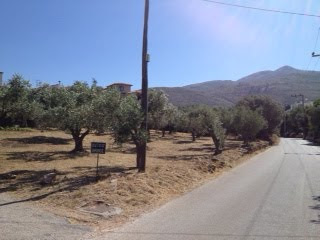 The road was lined with olive trees and led only to the monastery, and there was steady traffic. An elderly man pulled over and offered us a ride, which we gratefull accepted. The pilgrims at the monastery were full of the stories of St. Ephraim's miracles. We stayed for vespers. For an hour, there was an unending line of pilgrims kissing his relics. The peace and stillness around the saint was indescribable. The man drove us back to Athens, where we caught the metro back to the apartment. Nea Makri is close to Marathon and the road to Athens follows the famous route. 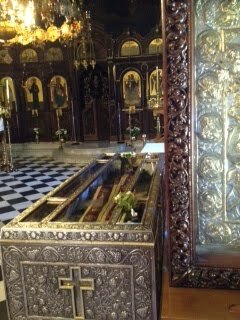 On Monday, Adrian and I visited St. Nicholas Planas. The man tending the candles could not find the icons I left and told me to return the next day. Adrian and I ate Indian for lunch and bought some last minute tourist kitsche. I rode the bus with Adrian to the airport. In the afternoon, I bought a cassock for Charlie. They brought me to the back room to drink orange juice while the lady hemmed up the bottom to fit. The view from the balcony was incredible. In the evening, I had a lesson with Arvanitis. After the lesson, Fotis and I hung out. We got McDonalds. I tried the "Greek Mac" which was basically a hamburger pattie dressed as a gyro. We grabbed a couple of beers at a kiosk and ate on Syntagma square. We made plans to leave early the next day for Aegina.